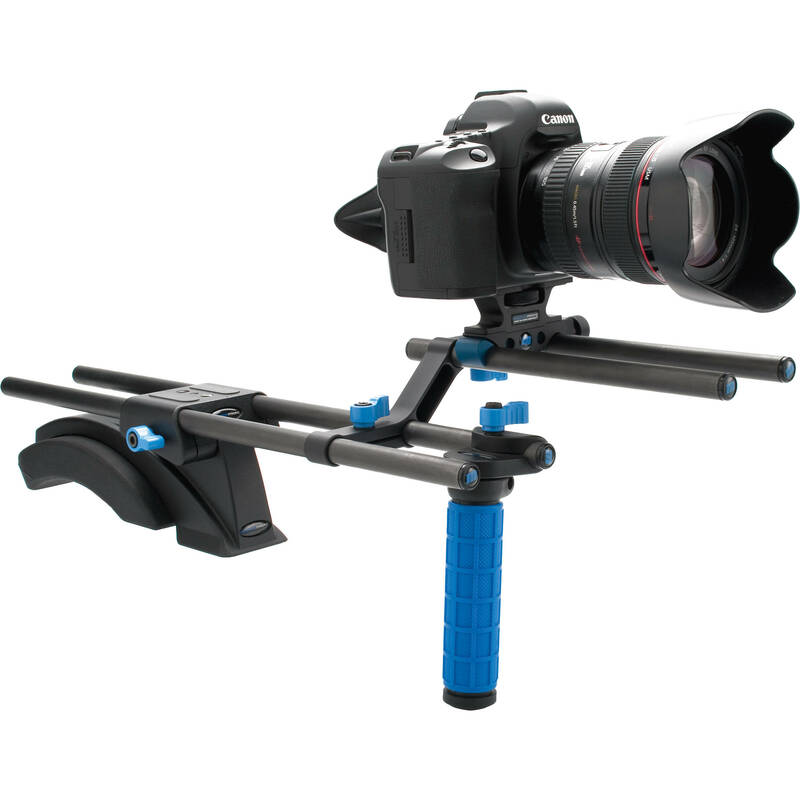 The eyeSpy Standard DSLR Rig from Redrock Micro is a bundled kit designed to turn your DSLR hybrid camera into a professional video rig. This model is intended as an entry-level solution to the eyeSpy series of bundles. It can always be upgraded to other models in the future if desired. Note: The microFinder loupe accessory is designed for attaching a 3" loupe securely to the back of the DSLR. The loupe is sold separately. The manufacturer currently recommends the Hoodman Hoodloupe 3.0. Use this bundled kit to turn your DSLR hybrid camera into a professional video rig. This model is intended as an entry-level solution to the eyeSpy series of bundles. It can always be upgraded to other models in the future if desired. Box Dimensions (LxWxH) 19.0 x 9.0 x 4.5"
eyeSpy Standard DSLR Rig is rated 3.9 out of 5 by 7. Rated 3 out of 5 by MxPxP86 from Simple, Direct, Does What it Should It is expensive, and I'll most likely be fitting some additional weights as counterbalance due to the significant forward weight there is on the arms without it, but besides those two detractors, the rig almost makes me feel like I have a gargantuan betacam camera on my shoulder again. And it is built like a rock, so kudos for that. Its total weight is very pleasing, however the distribution is improper without additional weights sitting behind the shoulder. Rated 5 out of 5 by LopezDeLaGomez from Solid but get the eyespy balance I've had this for a couple of weeks now and it's absolutely essential for shooting video on a 5D mark ii or similar camera. I have a great Miller tripod but adjusting height and moving sticks just becomes time consuming. This allows for shots that are hundreds of times steadier than handholding a DSLR and much faster than constantly using a tripod. Your tripod plate also attaches right to it. Build is solid and I adjusted this many ways to make it fit my shooting style. I got the standard package because I thought I'd build the counter weight device but I'm getting the redrock weights. You need a good 4 pounds on back. I also plan to get the double handgrip and the micro handle for carrying it from the top. It's a little pricey but that's the nature of the industry and non-component cameras sell for a lot more than the 5D so the extra costs come out to about the same. You can build a DSLR video package to your liking. This is the most solid solution for shoulder mounting a DSLR I've seen and it does it's job. You still have to know how to shoot though. It's not magical, just solid. Rated 3 out of 5 by Itinerant from Good but not perfect I use this rig for run and gun documentary shooting. The build quality is good and sturdy, but not perfect. Some of the threaded holes to clamp the rods are wearing out after only a few uses. Very customizable, but additions cost a lot. Biggest shortcoming is lack of a top handle or good way to add one. Rated 5 out of 5 by Evalano from Great for DSLR video! Lightweight and fantastic if you need to move around. Gives you the feel of shooting with a standard shoulder-mounted camera. In retrospect, I wish I had gotten the version with the counter-weight. After a couple hours of shooting, you really feel the difference and that added balance is next on my shopping list. Also, if you are going to use a battery grip, be sure to get the version with a straight riser. Overall a great addition to a DSLR setup. Rated 4 out of 5 by Cebido from Not complete, but its a start. I use a larger broadcast camera for work and have gotten used to carrying cameras on my shoulder. The eyeSpy standard helps replicate that a little bit. Hand holding a DSLR camera gives you undesirable results. Its a great starter kit if you're planning to expand. I've had Redrock products for years (including the M2 Encore and microFollow focus) and have always been happy with the performance. Rated 5 out of 5 by Anonymous from its amazing!! It makes using my camera handheld much easier. Can this rig easily be mounted to a tripod? It can. The front of the shoulder pad can accept the 1/4 and 3/8 screws of video head quick releases. However, this rig is offset so I would have to recommend putting the camera support base that is on the offset onto the two rods the shoulder/tripod base is holding. 1. This will be more stable and 2. The camera will be centered on the tripod nodal point.